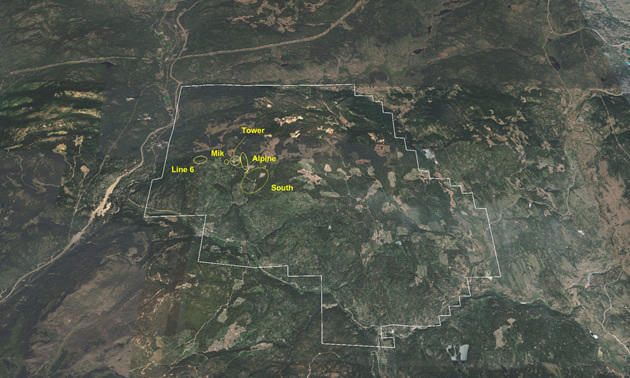 Map of Shovelnose Claim Block — Photo courtesy Westhaven Ventures Inc.
Westhaven Ventures Inc. (TSX-V:WHN) reports that an airborne geophysical survey has commenced at its 15,542 hectare Shovelnose gold property, located within the prospective Spences Bridge Gold Belt (SBGB), approximately 30 km south of Merritt, British Columbia. Westhaven has engaged Precision GeoSurveys Inc. of Langley, B.C. to fly a helicopter-borne high resolution aeromagnetic survey over the entire 15,542 hectare property. The survey block will be flown in a systematic low-level grid pattern at 75 metre line spacings, covering a total of 2,376 line kilometres. The purpose of this program is to increase property coverage and to help uncover favourable structures. It is important to determine structural controls that may be associated with additional zones of gold-silver mineralized veins.